Home › Blog & Recipes › 3 Minute, 2 Ingredient Millet Amazake "Custard Parfait"
Coming off the whole Cancer Causing Children's Snacks debacle in Hong Kong, we understand the difficulties to find healthy and delicious snacks your kids can enjoy! That’s why I created this worry-free recipe for one of my daughter's school snacks. Its nut-free, vegan, dairy free, and organic, nutritious and.. super tasty! Think of those artificial puddings but instead, a delicious wholesome treat that’s full of vital nutrients for your kids to grow healthy and strong! The base of this recipe is organic millet amazake, which is essentially millet, fermented rice, and a pinch of salt!! It’s creamy and thick with a hint of sweetness, and used a lot in traditional Japanese desserts. Why is Millet and Amazake Good For You? The sweetness is from the freeze dried berries that I infused into the amazake. As the berries soak up the amazake liquid, it becomes like a fresh berry again and also the texture of the amazake becomes more like a custard (but vegan!). You can also use other berries such as blueberries or wild strawberries but my personal preference is to use raspberries as the sourness is a good balance with the sweetness of the Amazake. Just serve this without saying anything to your kids - and trust me, they won’t even notice its a vegan healthy treat. Hope you like this as much as my kids do! P.S - it's not just for kids. Want a guilt free dessert option after dinner? Try this custard out for yourselves too! Place about 6-7 pieces of raspberries on top of the Millet Amazake base and cover that with another 2 Tablespoons of Millet Amazake. Amazake is a naturally sweet (no sugar added) non-alcohol drink, traditionally made from koji and glutinous rice. However, many commercially sold Amazake from Japan is sweetened with sugar and made by sakekasu (the rice pulp from making sake) mixed with water. 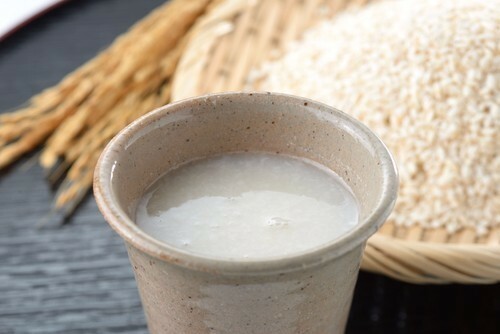 Amazake is not only a delicious dessert, but it is also very nutritious as it contains Vitamin B1, B2, B6, Folic acid, Oligosaccharide, Cysteine, Arginine and Glutamine and plant-based lactic acid which is great for gut health! We also sell amazake drinks on their own as well!